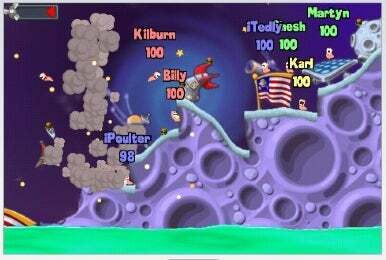 Team17 Software has released Worms for the iPhone and iPod touch. It costs $5 and it's available for purchase and download from the App Store. Use a variety of imaginative weapons to blow your enemies up in Worms for the iPhone and iPod touch. Worms is the classic turn-based strategy game in which you control warring worm armies. It's turn-based and 2D, though it features richly illustrated cartoon graphics. Essentially an artillery game, you must use the right ammunition to destroy your opponents. Worms features single-player and multiplayer support, for up to four players. The controls have been designed for the iPhone, and it includes 50 different challenges with unlockable items, six different environments with random battlefields, personalized team names, voices and gravestones, custom music support, auto-save on exit and iPhone OS 3.0 features in the works. System requirements call for an iPhone of iPod touch running iPhone OS 2.2.1 or later.